I've got a mermaid at my house. She is 5. Has long red hair. Enjoys playing in the pool or bathtub...daily. Loves belting out songs from any musical or just some she has made up on the spot. She truly is my little mermaid. And requests ALL the mermaid things. Which means I had to figure out how to make a mermaid pillow. You know, I couldn't disappoint her. She is a mythical creature after all. Have you ever sewn on mermaid sequin fabric? Not my favorite. 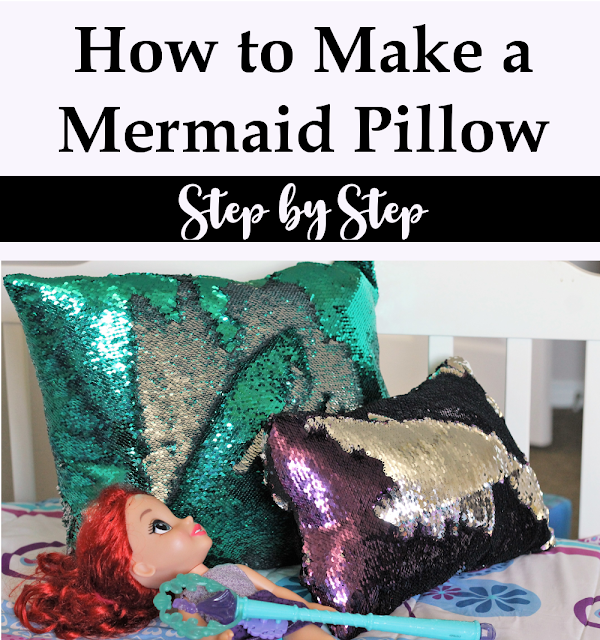 There is a lot more work involved in sewing a mermaid pillow. I was really hoping to find the awesome mermaid sequin fabric. Which turned out to be much easier than I thought it would be. I just jumped over to Etsy and found exactly what I was looking for. And it shipped quick. What probably took longer, was getting my fabric prepped. Since prep takes a bit, I wanted to share how to sew sequin fabric since it can be tricky.